We are located in one of Ireland’s most picturesque and serene spots. A stones throw from the pristine white sand of Gurteen Bay, just metres from the rolling waves casting off crystal clear turquoise tones, and with a backdrop of Errisbeg Mountain ever present and changing its complexion with different swings in the Irish weather, Gurteen Bay Caravan Park offers a stunning place to have a holiday. Gurteen Bay has long been established as the most desirable play in Connemara to go camping. The camping ground is set between Dogs Bay and Gurteen bay. 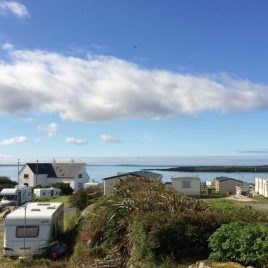 The camping ground at Gurteen Bay is exceptionally well provided for with all the modern amenities that available to the residents of the Caravan Park. Showers, toilets, cooking room, activities room, and water sports hire are available.